It was Christmas tree trimming night at our house. That meant pulling out the delightfully mismatched- yet memorable- ornaments, putting on our Santa hats, drinking eggnog and listening to Alabama Christmas (that's a throwback to Rodney's childhood). Our tiny house is filled with the smell of pine. I love this night of the year and all the traditions that come with it, no matter how cheesy. Each year we gift each other with a new ornament, sometimes store bought, sometimes home made, always something meaningful from the year. 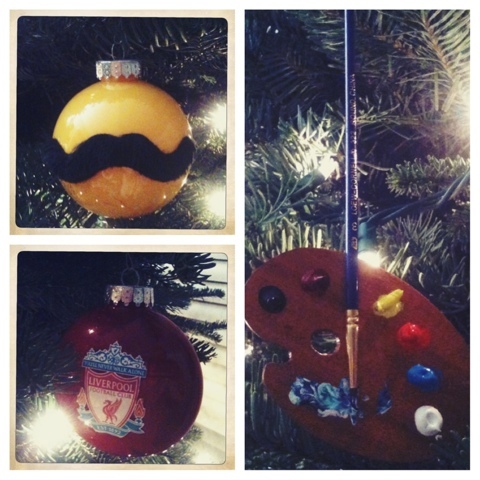 Last year, my thoughtful husband got crafty in his wood shop and cut out a little wooden paint palette, then decorated it with acrylics and a paint brush. It's one of my favorites and it really captures the spirit of my artful 2011. I'm still contemplating what ornament to make him this year and am excited for my surprise. 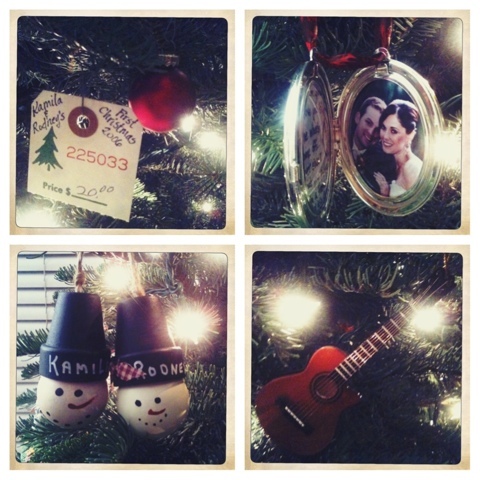 It's fun to look back on the years of Christmas memories hanging from the branches.